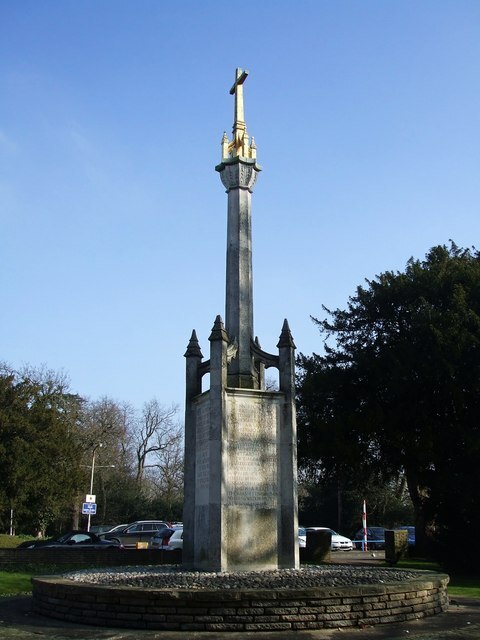 Potters Bar War Memorial commemorates the 70 fallen of WWI and the 56 of WWII who came from Potters Bar, Little Heath and Bentley Heath. It was originally sited at the convergence of Hatfield Road and The Causeway but was moved in 1972/3 to make holding remembrance services easier; there was also the possibility that there was to be a roundabout at its original location though this never came to pass (as at 2013). The monument is in quite an unusual style being Gothic revival with an Arts & Crafts influence. In the Pevsner guide to Hertfordshire, he remarks on the interesting lettering used on the roll of honour. The architect was Charles Francis Annesley Voysey (1857 - 1941) Link and it dates from 1920, being unveiled by Rear Admiral Sir Lionel Halsey. To the glory of God & in memory of the men of Potters Bar Little Heath & Bentley Heath who gave their lives in the Great War 1914-1918 by their sacrifice we live.